DESCRIPTION This mature detached bungalow, with brick elevations under a tiled roof, offers spacious accommodation and occupies an exceptional plot with a sunny south facing rear garden. Benefiting from gas central and double glazing the bungalow offers scope for some cosmetic updating and currently provides an entrance porch, hallway, fitted kitchen at the front, lounge at the rear leading to a large double glazed conservatory, three bedrooms and a shower room. One of the primary attractions of the bungalow will be the generous size plot which enjoys a sunny southerly aspect and with a long patterned concrete driveway leading to a carport and detached garage at the rear. 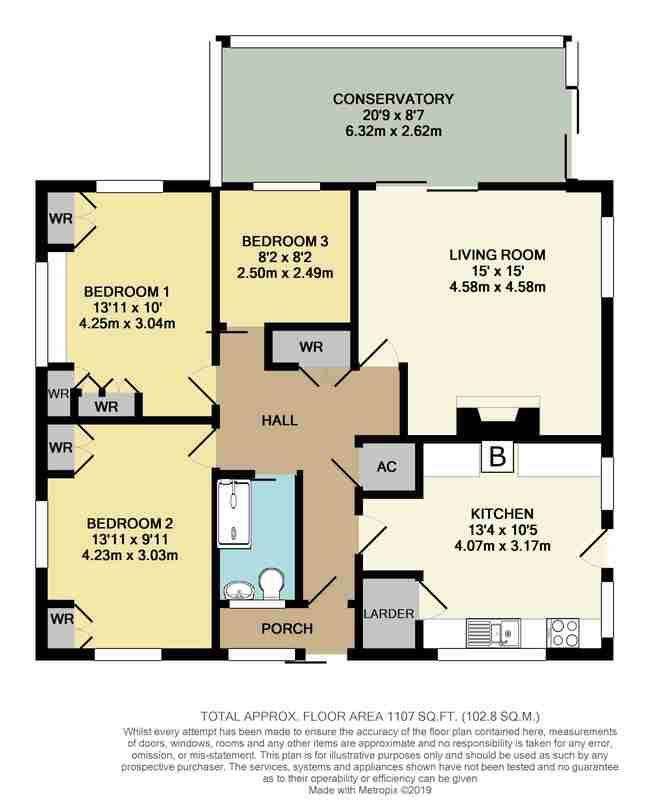 An excellent opportunity to acquire a bungalow in a prime residential area and an internal viewing is strongly recommended. SITUATION The property occupies a choice position at the end of a cul de sac in a prime residential area off West Coker Road where there is a general store and the town centre with its comprehensive range of shopping and leisure facilities is under 2 miles distant. HALLWAY with coved ceiling, access to the insulated roof space, built-in airing cupboard housing lagged hot water cylinder and built-in double cloaks cupboard. KITCHEN 10’10” (3.3m) x 10’4” (3.15m) having an excellent range of wood fronted units comprising a stainless steel one and a half bowl single drainer sink with mixer tap, heat resistant work surfaces with part tiled surround, 10 base cupboards, 6 eye level cupboards, electric cooker panel, plumbing for washing machine, built-in pantry, florescent strip light, gas boiler, double glazed windows to the front and side and double glazed door to the driveway. CONSERVATORY 20’11” (6.37m) x 8’8” (2.64m) UPVC double glazed with polycarbonate roof and sliding doors each end to the driveway and garden respectively. BEDROOM ONE 13’10” (4.21m) x 9’11” (3.03m) with coved and artex ceiling, radiator, fitted wardrobes and dual aspect double glazed windows. BEDROOM TWO 12’ (3.64m) plus recess x 9’11” (3.03m) with radiator, coved and artex ceiling, fitted suite of wardrobes, chest of drawers/dressing table and dual aspect double glazed windows. BEDROOM THREE 8’2” (2.49m) x 8’2” (2.48m) with radiator, power points, coved and artex ceiling and double glazed window to the rear. SHOWER ROOM having a modern white suite comprising a large shower enclosure, tiled surround and thermostatic shower, close coupled WC, pedestal wash basin, part tiled walls, heated towel rail and double glazed window to the front. OUTSIDE The property occupies a generous size plot in a choice position at the end of a cul de sac having a patterned concrete driveway leading to a CARPORT 15’ x 9’9” and to a DETACHED GARAGE 18’7” (5.66m) x 9’10” (3.01m) with up and over door, light and power connected and UPVC double glazed window. The front garden is mainly gravelled behind a brick boundary wall and a large rear garden is well established, laid to lawn with several flower beds and a garden shed. 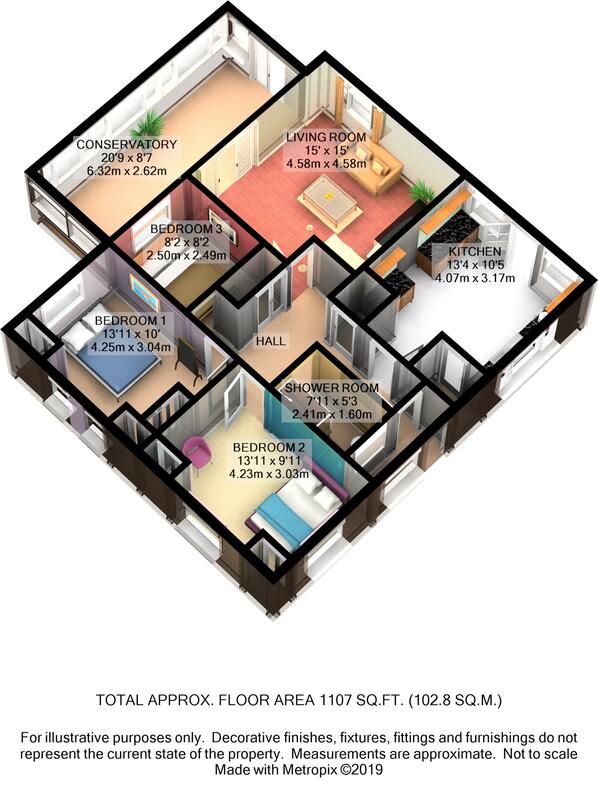 OUTGOINGS The property is in Band D for Council Tax purposes with the annual amount for 2018/2019 being £1,699.49. 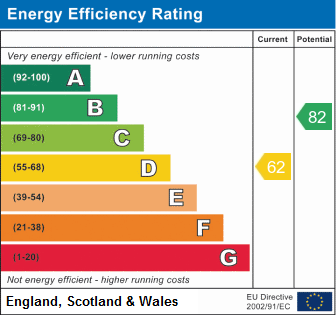 Energy Efficiency Rating D.